Hi, everyone!! It’s an exciting day today because the entire Heffy Doodle June release is available for purchase today! Woo hoo! This release is amazing, and I really think you’re going to love it. We’re celebrating with a blog hop today, so if you’re starting here make sure you go back to the beginning and see all the projects at each stop. 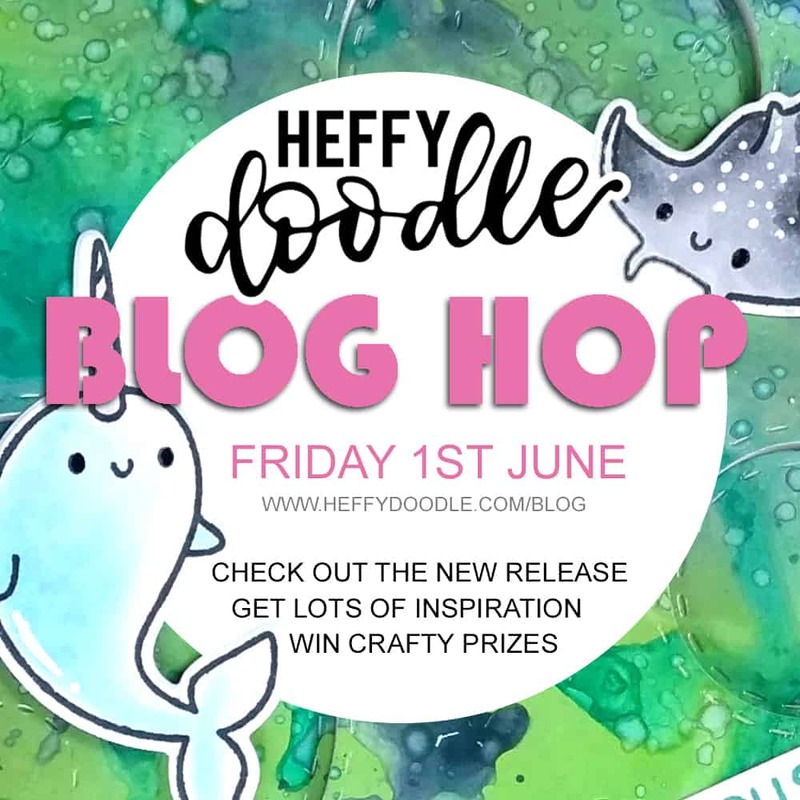 Leave a comment on each as an entry for the prize of a £50 voucher to the Heffy Doodle store. Let’s get to my project! I used a leafy background die to create a jungle/watercolor background for my card. I did some ink smooshing with Twisted Citron and Lucky Clover Distress Oxide ink. I adhered that directly to my card base. Next I stamped out one of the cute birds from Wingman and colored him in with my Copics. I die cut him out with the coordinating dies and attached him to the card with an action wobbler. What better interactive element for a ‘shake your tail feather’ card?! Then I die cut the largest of the Stitched Strips of Ease dies from white card stock and ink blended Spun Sugar and Picked Raspberry Distress Inks over top. I made sure it was completely dry and then I heat embossed the ‘hooray’ from Big Bold Words on it with gold embossing powder. This piece was attached with foam tape to the card, and the smaller sentiment was stamped directly to the background with black ink. 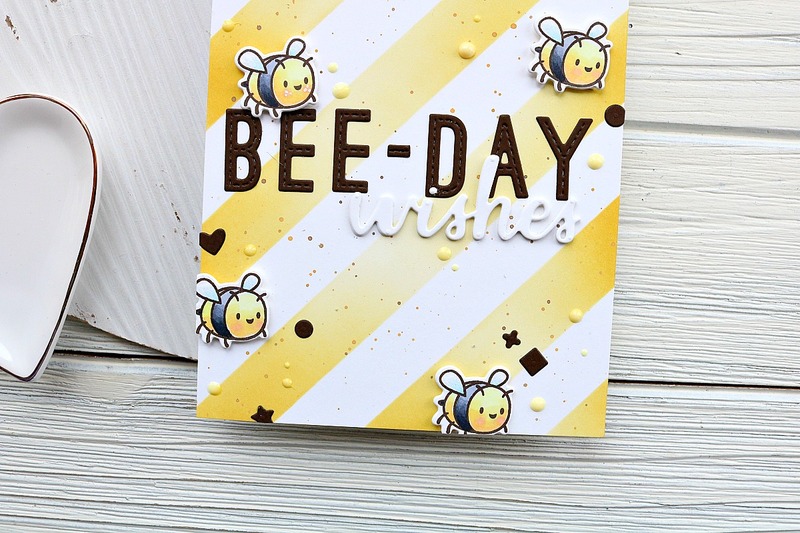 To finish off the card I added a couple Crystal Nuvo drops in a light pink color and white gel pen accents. And that’s it for my card! I hope you enjoyed! Below is the hop list so you can keep on hopping! Have a great day! Next Butterfly Reflections Ink Blog Hop! So pretty!! I love the background – great idea! The background is perfect and your right, who could ask for more than an adorable parrot on an action wobbler! Wow.. those negative die cut leaves.. they add amazing effect to your fabulous card! 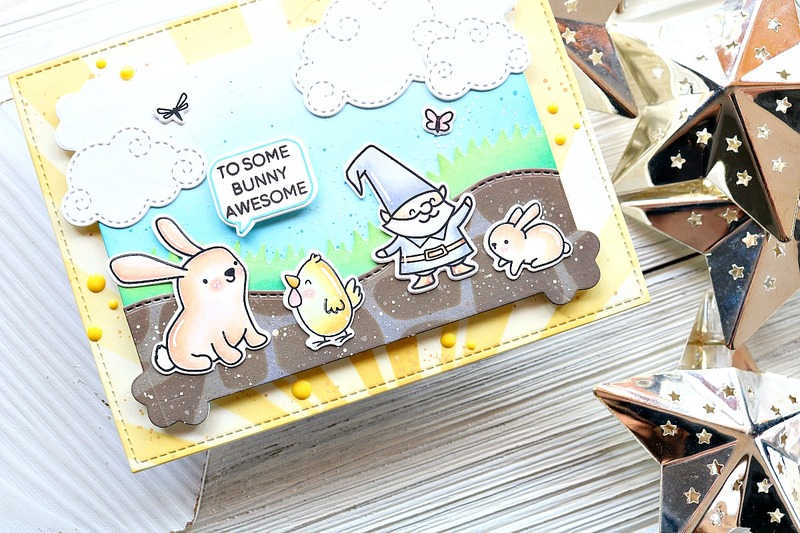 This is my most favorite stamp set from this release ,loved your card and refreshing colors. Love the way you created your background… so pretty! And the bird and sentiment are so fun! Really great background. Nice coloring on the bird. I love this bird! 🙂 Great card! I loved the background on your card as well as the coloring on your adorable bird. Such a fun card! So tropical! Stunning card! 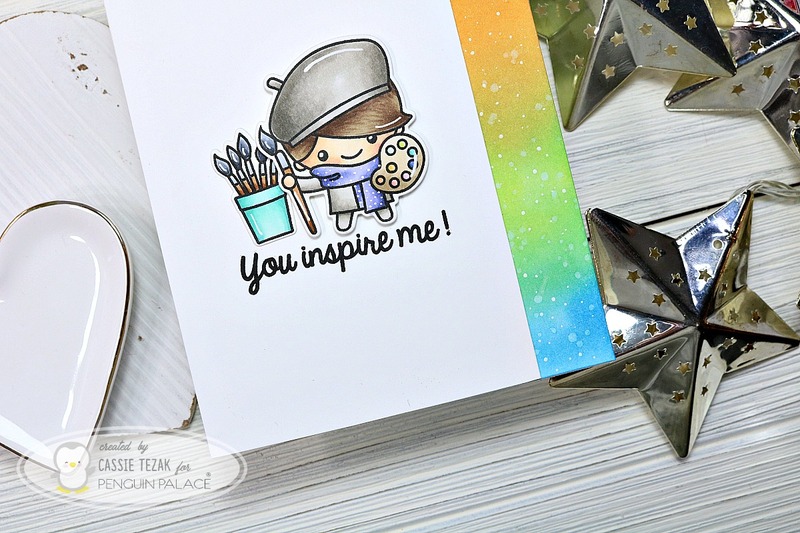 I’d love to know the background die you used – awesome inking, really makes the parrot and sentiment pop! The background on this is absolutely stunning… such a wonderful card!! LOOOOVE your design, your fantastic use of colour, and that cute bird and sentiment! Very well done, this is a fantastic card! That leafy background is amazing and just love that cute bird! Wow, gorgeous card! Amazing background and lovely coloring. Very cute card! I love the background – great technique!! The background is fabulous, and I love how the parrot matches it, but I think my favorite part is your choice of pink accents. I wouldn’t have thought to go there, but it looks fabulous and adds a lot to your card. Thanks for the inspiration! Stunning card, that bird is beautiful! Love the sentiment! WOW i’m in love with your background!! Love the birdie flying through the forest. Your card makes me want to plan a vacation!!! Love that parrot and the thought of him shaking his tail feathers, lol, love it! Your background is gorgeous and perfectly paired with that adorable bird. Thanks for the inspiration. Wow !! You’ve made such a great card !! Your little bird is super cute and your background is magnificent ! !